← Queen – It’s A Hard Life. 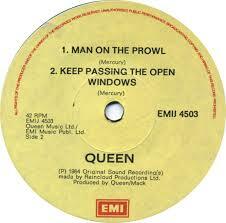 Queen – Man On The Prowl. Publicat pe 25 septembrie 2015	de Cristi M.
During the 1970s, their friendship became closer, with Everett becoming advisor and mentor to Mercury, and Mercury as Everett’s confidante, helping him to accept his sexuality.Throughout the early-mid 80s, they continued to explore their homosexuality, as well as experimenting in drugs, and although they were never lovers, they did experience London night life on a regular basis together. By 1985, they had fallen out over a disagreement on their using and sharing of drugs, and their friendship was further strained when Everett was outed by his biographer Audrey Lee „Lady Lee” Middleton, with Mercury taking Lee’s side.With both suffering from failing health, Mercury and Everett started talking again in 1989, and they were able to reconcile their differences.